17-Jan-2005 -- Yesterday morning began with stormy seas. A high pressure over Central Europe and a low over Crete caused a strong flow of air via the Balkans and Italy towards the Ionian Sea. So we continued to steam towards the east coast of Sicily to seek shelter there. The normal course from Turkey to the Strait of Gibraltar is south of Sicily, but I decided to pass the Strait of Messina, as weather reports for the Tyrrhenian Sea were better than those for the area around Malta. The deviation when sailing through the Strait of Messina is about 70 nautical miles (130 km), but this is no problem. At about 5 p.m. we arrived close to the coast of Eastern Sicily, where the sea gradually began to calm down. Looking to the shore we see the so-called "Costa dei Ciclopi" (Cyclopes' Coast) and "Isole Ciclopi" (Cyclopes' Islands) north of Catania, or more precisely, at Aci Trezza. Most readers will know the story of the Cyclopes, which lived just here, on the slopes of Mount Etna. Homer tells us about them in the 9th Song of his "Odyssey": The Cyclopes were giants with only one eye on their front. They did not worship any gods, nor did they know any law. Hospitality was unknown to them and brutal violence prevailed in their land. When Ulysses arrived with his men, the Cyclops Polyphem caught them and brought them to his cave. As the Cyclopes were cannibals, he intended to devour them one after another. A few ones he had already eaten, but then smart Ulysses gave him to drink plentiful wine, in order to improve his digestion. Soon Polyphem was drunk and fell asleep. Ulysses and his men took a trunk, made it glowing above the fire and rammed it into the Cyclops's only eye. Polyphem suddenly awoke and was crying of pain. Ulysses and his men, however, could not escape prior having removed a heavy stone with which the giant had closed the entrance of his cave. So Ulysses used another trick. He and his comrades tied themselves below the bellies of the sheep, and the next morning, when Polyphem removed the stone in order to let the sheep go to the pasture, they could leave the cave. Polyphem, however, knew about some similar idea and checked the sheep by palpating them prior to letting them go. But as the Cyclops was rather stupid, he checked only their backs but not their bellies. It was too late when Polyphem realized the Greeks managed to escape. As he was blind, he asked the other Cyclopes for assistance. His fellows, when seeing what had happened to his eye, asked him who had done that to him. And Polyphem replied: "Nobody has done it! Nobody has done it! Search for Nobody! Chase Nobody! Get me Nobody!" (Sly Ulysses has told him his name to be "Nobody" when Polyphem had asked him the day before). So his fellow Cyclopes were rather helpless, and they asked him, how could they help him if "Nobody" had done it? Once again on board, Ulysses shouted a final curse towards Polyphem. This drove the Cyclops completely mad and he took large rocks and began to throw them in direction of the ship. And just these rocks, the "Isole dei Ciclopi", we can see still today off the coast of Aci Trezza. ἔδμεναι ἐν σπῆι γλαφυρῷ κρατερῆφι βίηφι. Listen, O Cyclops! Hear me, ungracious host! the god, the god revenges by my hands. τυτθόν, ἐδεύησεν δ' οἰήιον ἄκρον ἱκέσθαι. And near the ship came thundering on the flood. Ask, who disfigured thus that eyeless face? Laertes' son, of Ithaca the fair. Note: Some readers may have difficulties to get the font (Palatino Linotype) properly displayed. For instructions please see my visit 40N 26E – there is a link). 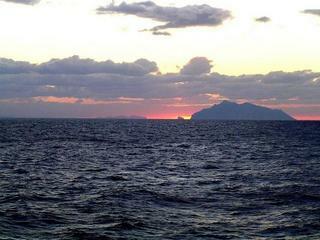 Well, in the evening we passed the Strait of Messina and weather in the Tyrrhenian Sea was excellent. So it had been a good decision to deviate. And today morning we were again on 38N 12E. If this continues and I have to take more frequently the Strait of Messina on future voyages, the Island of Marettimo will turn out to become my "Mediterranean Gogland Island". Well, around Marettimo everything is unchanged, but this time I attach a picture of the island of Levanzo, which is one of the other islands of the Aegatian Archipelago (Isole Egadi). Both islands, Marettimo and Levanzo could be seen this morning. And due to the beautiful sunrise, I attach two additional pictures of Marettimo (pic #6 and pic #7). Soon we had plain daylight and a seagull was following us for a long distance. And another welcome meeting: A family of dolphins crossed our way. These friendly sea mammals are quite common in the Mediterranean Sea, but it is not easy to take pictures of them. In the thirties of the last century, Italian fascist leader Benito Mussolini had planned to depopulate all these small Italian islands and transfer its inhabitants to the mainland. Of course in these days life without water, electricity, proper medical care and without regular supplies was not easy there, and it has been argued that modern Italians do not deserve such a life. This was a plan by the Great Fascist Council. The islanders themselves, however, have not been asked for their opinion. But when fascism collapsed, among many other ambitious projects, this plan has been abandoned prior its realization, too. And today the inhabitants of our islands feel certainly well and have a nice life. The only disadvantage when living on such an island is the fact that everything is extremely expensive. Food, for example, may cost well double than on the mainland. In the sea, but with a good view of Marettimo Island.